Despite a lackluster home opener, the Philadelphia Union were able to accomplish one of their key goals this season: set the defensive tone with their first shutout. It may not have come against the strongest team in the league, but the Union held Colorado to two shots, neither of which hit the target. 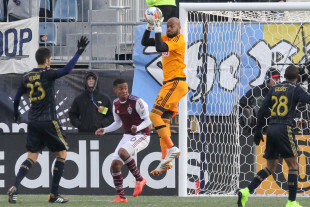 Outside of a muffed clearance by Ethan White, Rais Mbolhi’s goal stood largely untested. One thing that instantly jumps out is the play of Sheanon Williams and Ray Gaddis, who combined for four tackles, eight interceptions, four clearances, and two blocks. 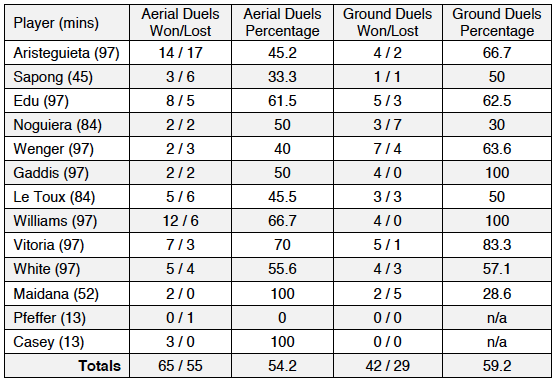 Additionally, Sheanon Williams won twelve aerial duels and four ground duels, which expresses the manner in which he locked down the right wing all game long. Looking at the statistical performance of the two outside backs, it’s no surprise that Colorado wasn’t able to complete a single cross from live play. 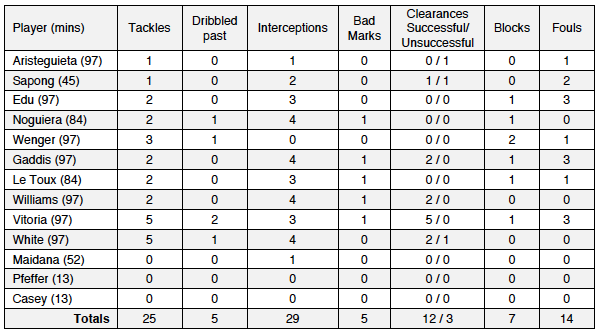 Although he didn’t necessarily have much to do, Rais Mbohli played a solid game at the back. His distribution still needs work, but he was a commanding presence in his box, and did well to handle a number of crosses while he was being harassed (or fouled) by Colorado attackers. So yes, it came against an inferior team, but the Philadelphia Union got off to a good start defensively. It will be interesting to see how they shape up against their next opponent, Real Salt Lake. Author: Davis Russell Davis is a former collegiate lacrosse player with a concussion shortened career. You can find him in Section 109 wearing a 2010 away jersey. Follow him on Twitter at @rsdavis08. I have a dumb question regarding the minutes. There was officially 6 minutes of stoppage time in the 2nd half and 2 minutes in the first half. Each went approximately a minute longer due to cards, time wasting, and Sapong’s injury. So how come the second half stoppage time counts as extra minutes while the first half doesn’t? I kind of made the executive decision on that, since nearly all of the first half stoppage time was spent in treating CJ Sapong. The remainder was spent by Rais holding the ball until the whistle blew, so there wasn’t really any action during those two minutes. Statistically, what is a “bad mark”? I agree, John. That seems like it is a very slippery category. Subjective, at best. I don’t mind subjective stats. I just want to know they’re subjective so I can weigh the stat with a proverbial grain of salt. Yeah admittedly it’s quite objective. To give you an example, I would consider when Sebastien Le Toux was defending deep on Colorado’s left side. He got sucked inside and covered Sheanon William’s man instead of his own and allowed a wide open overlap. I’ll likely discontinue this stat just because of its subjectivity. Keep it for a few games, so you get a larger sample size. Again, subjectivity isn’t bad – though it requires consistency, of course. So let it build for a few games and then re-evaluate. Thanks for the reply to try and define the metric. It’s appreciated. The only silver lining in Saturdays match was, yes…………………they held the opposition to nothing and kept a pretty good shape. There next couple opponents will put much more pressure on them…….. I get that it’s one game against a very conservative opponent, but the stats above are additional support for appreciating what we have in Williams and Gaddis. I think the need for a “true” LB is frequently overstated, and that two of our most dynamic players happen to play fullback. We’ll be fine with this pair. +1. I’ve been saying this all preseason. Given how hard it is to get a really good LB in MLS, I think Ray Gaddis — who is excellent as a right back, and still pretty darn good as a left back — is likely as good as we can get (and as good as we need). I am much more concerned about defensive depth than I am about the starting fullbacks.